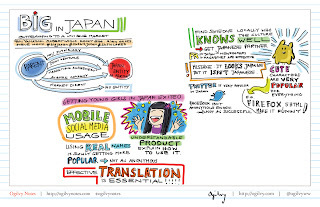 One of the coolest ways to take notes at SXSWi was through illustration. I happen to appreciate taking in content in a non-verbal way because I really think it stimulates different thoughts and a different way of processing. If you're at all curious about any of the content at SXSWi, the Ogilvy note I've featured came from a collection that can be accessed here. I don't happen to be particularly good at drawing, but my husband is. He sketched his way through life growing up. At church and at school, he processed through sketches. I think it might be part of the reason he's so curious. I'm co-facilitating an ideation session tomorrow that will feature a sketch artist to capture the nuggets of the session as it progresses, which is extremely helpful because some ideas can't be verbalized as well as they can be illustrated. Here's to processing thought in ways that are friendly to different learning and processing strengths.